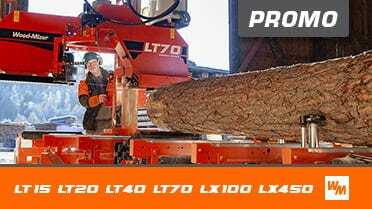 Incredibly versatile, the LT15 Classic sawmill is very popular because of its high quality, wide capabilities, proven reputation, and affordability. From enabling rural development, sawing multiple shifts commercially, to supplying quality lumber for the home hobbyist, this sawmill does it all. The LT15 Classic cuts logs up to 70 cm in diameter and 5.4 m long with the standard bed options. In order to cut longer logs, bed extensions can be added to extend the sawmill bed to any required cutting length. Thin-kerf blades require minimal energy consumption, so smaller motors provide sufficient power to cut all wood types. Petrol and diesel engine options are available. Logs are secured to the bed by the two standard log clamps and three adjustable backstops. Head height is precisely positioned by an electronic up/down motor. Cutting is accomplished by steadily advancing the sawmill head along the length of the log by turning a hand crank. Once the cut is completed, the head is pulled back and lowered into position for the next cut. A water tank feeds lubrication directly to the blade to improve cutting performance and keep the blade clean. The adjustable blade guide arm keeps the blade well supported while cutting various sized material. Blade tension is easily adjusted, and keeps the blade at the proper tension for cutting. 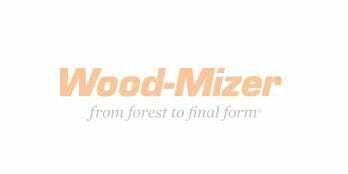 Wood-Mizer’s wide range of affordable blades can meet any cutting requirement, and deliver maximum log yield and minimal waste of the valuable timber. Increase productivity with Setworks - simply select the board thickness required and the head height automatically positions for each cut. Increase production by adding power feed forward/reverse. A debarker, which prolongs blade life by clearing away dirt and rocks from the bark, can be added to AC models. Add the MP100 moulder/planer in order to produce finished beams and moulded columns.